Cassie Steward hit four goals for Star. There was a big win yesterday (September 24) for Peterborough Northern Star in the East Midlands Women’s League. 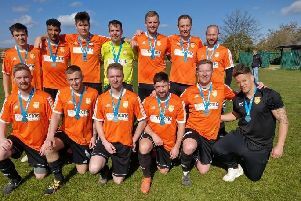 Dean Steward’s Premier Division title-chasers smashed Arnold Town 7-1 at the Branch Bros Stadium to make it two wins out of two. Bronwyn Mulheron scored a late leveller for Posh. Hot-shot Cassie Steward again had her shooting boots on, hitting four of their goals, with Vicky Gallagher claiming the other three. Star are second in the table, level on points with Eastwood. In Division One South, Peterborough United did well to come back from 2-0 down to gain a 3-3 draw against table-toppers Northampton Town. Bronwyn Mulheron struck a late equaliser in the 94th minute for Posh, who also had Emily Smith and Keir Perkins on target. In the same division, Riverside Rovers are still looking for their first win of the season. They lost 4-1 at home to AFC Leicester yesterday with Diana Olahova getting their consolation goal. In Northants League Division One, Peterborough Northern Star Reserves were beaten 9-2 at Moulton. Georgia Clarke and Deva Rawlings got their goals.